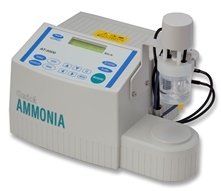 JM Science’s AT-2000 Ammonia Analyzer is based on coulometric titration technology and can measure ammonium-nitrogen (NH4-N) swiftly, accurately and easily without any specific skill by the end-user. The meter has a wide measurement range from low to high end with accurate measurement and is not interfered by turbidity or color of the sample. It has a short measurement time of typically one minute. A very small volume of the sample is necessary (0.1mL, 1mL or 10mL) and calibration is not required prior to the sample run. The electrode is stain resistant, has little influence to temperature change, and has a long life compared to ion selective electrodes. Only one type of environmental-friendly reagent (dedicated electrolyte) is used which means lower costs for budget-minded laboratories.